Ahh. A quiet Sunday to myself. I was looking for a delicious, comfortable brunch and found it in Lina Frey on Houston between Ludlow and Orchard. No line, brunch deal, open front. Perfect! I enjoyed a delicious meal while reading by the window. Lina Frey has a few options when it comes to brunch deals. I also noticed an option on their sandwich board (but not menu) to add a bottomless carafe for $15 per person. I chose the Croissant Monsieur for my meal. 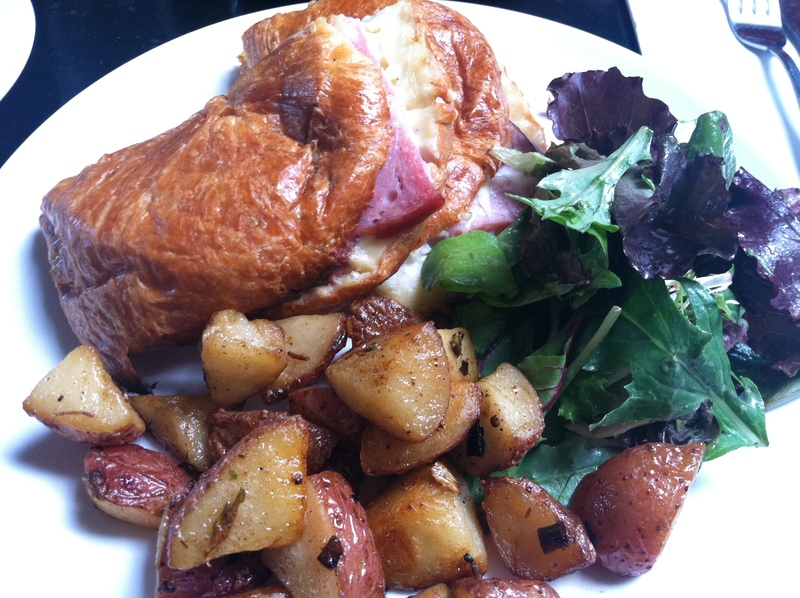 Swiss cheese and a healthy chunk of ham was melted him between a huge, fluffy croissant. This came with roasted potatoes and a small salad. The waitress brought a small dish of sea salt, which was perfect for the potatoes. « Cake at Irving Plaza: I need a Vibraslap!